The first car I drove – as a job – HubNut – celebrating the average! I never forget how lucky I am to get to write about cars. Sure, it’s not the blissful life of sheer joy that many people imagine – for every minute of wheel-time, there’s often weeks of sitting in front of a computer thinking of new and existing ways to describe rust – but I can’t deny that there are far, far worse things to do with one’s time. Sure enough, my writing career began by sitting in front of a computer and bashing some words out. I wrote a feature about estate cars and was lucky enough for it to be published in Classic Car Weekly back when it was owned by Kelsey Publishing. Getting published was a massive buzz and would soon reap further work. Some of that work saw me sitting in the archives of the Coventry Transport Museum as I researched a feature on that great (but not as great as Birmingham) city and it’s marvellous history of producing vehicles. And sewing machines. But then I got the call. Would I mind driving three vehicles as miniature road tests. Hmmm. Let me think about that for a moment. NOT IN THE LEAST! I headed to a dealership and tried not to dance around in circles as I chose my three vehicles. It wouldn’t have seemed very professional to actually run around screaming “Oh My God! Oh My God!” so I didn’t. I’m made of stern stuff. There was an incredible selection of vehicles to sample, including an Austin-Healey 3000, an early MGB and a Jaguar Mk2. Ok, I may have been screaming silently in my own mind. So, I naturally chose a Mercedes-Benz 350SE in light beige, or cream as most people prefer. Well, I’ve always liked to be different and this Germanic beauty had captivated me since I was a child. Probably because the wipers were enormous and a bit odd, with the same wiping pattern as my aunt’s old Morris Oxford. Just larger. 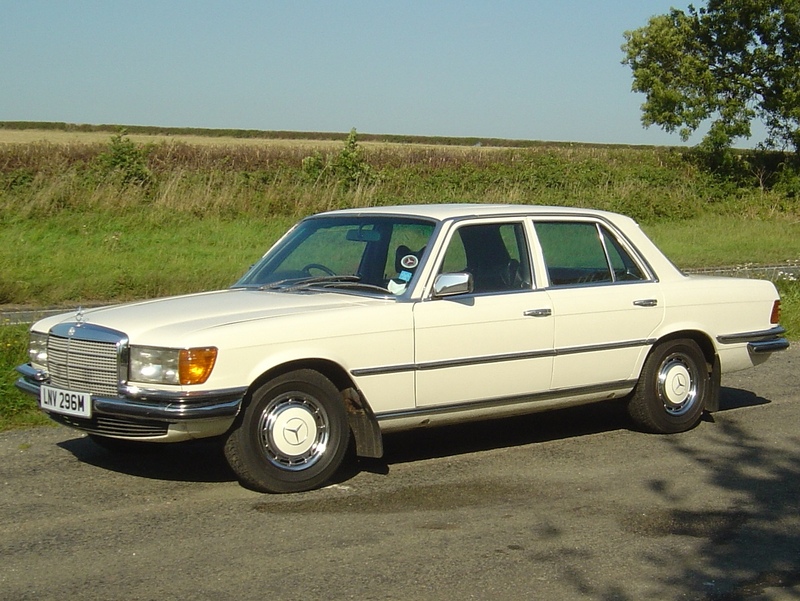 This was a really early one – the W116 350SE was only introduced in 1973 and from memory, this example was from 1974. Clambering aboard was a bit of an anti-climax as the interior was rather bland and entirely black. What you see in an S-Class will inevitably be a feature of cars of the future. Tedious, all-black interior design started here. Happily, things got merrier when the 3499cc V8 fired into life. It was all starting to feel a bit modern, but the fuel-injected, overhead camshaft motor had a touch of rortiness about it, especially when extended. In fact, the driving experience was an unusual mix of V8 soundtrack, slushmatic gearbox and a typical, enormous steering wheel which, through recirculating ball steering, offered the usual vague control of direction. I managed to control myself enough to get a reasonable photo of it, though the shadows are a bit off-putting. Sorry about that. I could have chosen a dream sports car. Not me! I’m not sure I kept a copy of the resulting write-up – my filing system isn’t the best – but I hope I did. I hope my words were constructed with rather more care than the photo composition too. I had rather more time to carefully consider those at least. I did then take the Austin-Healey out and despite almost having to use two hands to change gear, I did thoroughly enjoy it. I must boringly concede that the 3000 is bloody excellent fun, with an ear-splitting soundtrack and daft enough performance for me. I did lose my cool somewhat though as my hat blew off as I overtook someone and then I ran it out of fuel. Oops. It was all part of the learning experience but even now I struggle to get across how exhilarating the Austin-Healey experience was. But the Mercedes was a good reminder that from the start, I was never out to drive just the famous and the brilliant. I’ve driven a Wartburg and it was hilariously entertaining, though the build quality didn’t quite compare with a Merc. Yet I was almost more excited when this year finally gave an opportunity to drive an Austin Montego – the first time I’d had a chance to drive one since I was 17, and a very-freshly qualified driver. How different the car felt when driven at two very stages of my life and experience. But I’ll never forget that first drive, nor the buzz from writing that first feature. I was finally able to turn my back on job misery and combine both my love of English language and my insatiable appetite for cars. And that’s important. If you want to write about cars, it’s essential that you can get as much enjoyment for sending a cursor across a screen spitting letters out behind it as you do from twirling a wheel and pressing the go pedal. Writing is like a drug to me. A stationary cursor almost causes me physical pain (which is why I often ignore it and have a cup of tea instead). And it all started with a beige Mercedes-Benz. I wonder where it is now.